Feeling stuck? Experience the power of being unreasonable. Something from my training with Landmark Education that has stuck with me over the years is the power of being unreasonable. What do I mean by being unreasonable? It’s very simple – it’s all about having reasons not to do something…and then doing it anyway. Sometimes there are perfectly valid reasons for not taking something on. For example, if I were about to set out on a road trip and learned that there’s freezing rain in the short-term forecast I’d likely choose to change my travel plans. I’ve driven in freezing rain before and know how hazardous this condition can be. In this case my reason for staying put is based on valuable experiences from the past. I’m going to focus on the other type of reasons that keep us from cruising down the highway of life – those reasons that are born out of ingrained patterns stemming from events in our pasts and cultural conditioning. Sometimes these patterns are so subtle that we’re not even aware of the reasons that are holding us back. By bringing a heightened level of awareness to our actions and inactions there’s an opportunity to experience life at a whole new level and to serve as a role model for others. 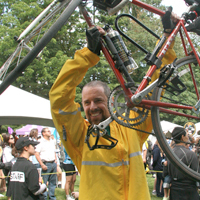 When I think about being unreasonable in my own life one example that comes to mind is my decision to participate in the Ride to Conquer Cancer in 2009, a 260km (160 mile) cycling trip from Vancouver to Seattle to raise money for the BC Cancer Foundation. What made this decision particularly unreasonable is that at the time I was going through an aggressive course of chemotherapy and was facing a major surgery. Some days I barely had enough energy to walk more than a few steps and wasn’t even completely sure that I was going to survive long enough to even attempt this athletic challenge. I had a laundry list of reasons not to register and went ahead and registered anyway. Having the boldness to register induced feelings of optimism and excitement. I committed to training for this challenge and to honouring my health throughout the process. All that I really had to lose was the registration fee and perhaps an ounce of pride. Within weeks of completing my cancer treatments I enlisted the services of a personal trainer and began the process of getting back into shape. It was slow going at first, but I gradually started to feel my strength come back and continued to focus on my goal. After being given the thumbs up from my oncologist I set out on my cycling journey with 1,700 other unreasonable people. I’ll never forget the feeling of exhilaration that I experienced as I crossed the finish line and hope that my personal victory served to inspire others who come face-to-face with cancer. I continue to practice being unreasonable and continue to reap the rewards. Sometimes it’s something as simple as having a conversation with someone that I had reasons not to have and saying “yes” to something that takes me outside my comfort zone. I’m inspired to create positive change in the world and realize that this is an inherently unreasonable ambition. All the more reason to continue practicing being unreasonable. The next time you notice yourself feeling stuck I invite you to take a good look at the reasons that are holding you back. Assuming there’s no freezing rain in the forecast, why not set aside your reasons and notice what’s possible once they’re out of the way? And then boldly move forward and experience the freedom and fulfilment of life on the open road. One of my motivations for participating in the Ride to Conquer Cancer was to serve as an inspiration to others who are going through cancer treatments and to demonstrate that it is possible to not only survive, but thrive after coming face-to-face with cancer. To help share my message with the largest possible audience I contacted media sources before setting out on my 262 km cycling trip from Vancouver to Seattle. The Friday before I left on my journey I had a phone interview with CBC, a portion of which was included in a story entitled Hundreds ride to conquer cancer that appeared on their website the next day. CTV News also captured my triumphant arrival at the University of Washington, a moment I’ll never forget. 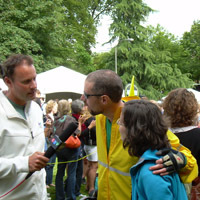 Moments after disembarking from my bike my wife Christa and I were interviewed by Perry Solkowski. A portion of this interview was included in the Sunday evening CTV News broadcast. 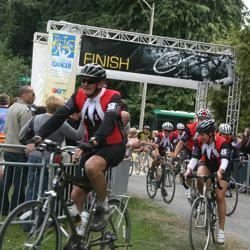 The news story can be viewed on a special Ride to Conquer Cancer page on CTV’s website. It’s the second link under the video player. Integrative Healing :: I attribute my healing to a combination of Western and Eastern treatments and practices and believe in the power of combining multiple approaches to healing. I was fortunate to have convenient access to InspireHealth, the only integrative cancer care centre of its kind in Canada and to have a wife who’s a talented holistic healer. The Power of the Mind :: I have been practising and teaching yoga and meditation for 15 years and practising martial arts (Shotokan Karate) for 20 years and the mental discipline that I developed through these practices allowed me to maintain an overall positive outlook on life, even on my darkest days. Life Coaching and Healing :: I worked with a life coach, Joni Mar throughout my treatment process to create a future in spite of my circumstances (i.e. being sick with cancer). Having ambitions and dreams gave me a strong motivation to live and helped carry me through the process. Working with a life coach also gave me an opportunity to learn the valuable lessons that going through a major life experience such as this provides. I have developed a workshop called It’s About Time™, that launched in Vancouver on May 30, based on these experiences. Please forward my contact information along to anyone in the media who may be interested. I also look forward to presenting each of these areas in more detail in future blog posts and to sharing the many lessons that I’ve learned through my bout with cancer. A couple of weekends ago I was one of 1701 people who participated in the Ride to Conquer Cancer, a 260 km cycling trip from Surrey to Seattle to raise funds for the BC Cancer Federation. Crossing the ﬁnish line marked a profound personal victory. Last year at this time I was in so much pain that I could barely walk a block. In July I was diagnosed with cancer and underwent aggressive chemotherapy treatments and a major surgery in the months that followed. I can remember wondering if Iʼd live to see 2009. Just before Christmas I received the best present I could have asked for, a clean bill of health. I started training for the ride in January, motivated to give back to the medical system that had helped save my life and inspired to be a living example that cancer is something that can be overcome. I attribute my own healing to more than just medicine. I received an outpouring of love, prayers and support from family and friends near and far and included Eastern approaches, including hours of Reiki from my beautiful wife Christa, in my healing regime. I also worked with my life coach, Joni throughout the experience to create an inspiring future in spite of my circumstances. Today I feel a newfound gratitude for my life and for all the wonderful people with whom Iʼm privileged to share my human journey. One person in particular who was on my mind and in my heart as I rode was Dan Northcott. He was diagnosed with Leukaemia around the same time I received my diagnosis and passed away at age 29, minutes after I set out on my bike Saturday morning. Through his spirit and courage he demonstrated what it means to live life fully and, inspired by the example he set, Iʼm committed to a life that is fulﬁlling and of service to others.